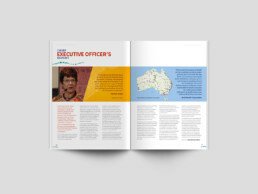 The National Aboriginal Community Controlled Health Organisation (NACCHO) is the national peak body representing 143 Aboriginal Community Controlled Health Services (ACCHSs) across Australia on Aboriginal health and wellbeing. Dreamtime created NACCHO’s artwork brand and has worked with the organisation on many projects. 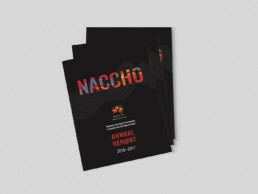 NACCHO’s 2016-17 Annual Report depicted the artwork in a stylised format and a spot UV laminate was placed over the artwork to give the impression of water flowing over rocks in a stream. 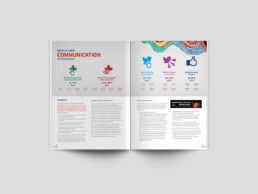 The annual report featured a colourful internal layout, infographics and financial reports.